Research now shows that around 1 out of every 3 searches are from a mobile device, which shows how important it is for you to optimize your small business web design for smart phones and tablets. There are many ways to optimize your mobile site, including making it easy to view and understanding the way mobile users search for content. Here are 6 tips to get you started. People perform searches differently on their mobile devices than they do on a desktop. To begin with, they often use shorter tail phrases to find what they need, and most searches are local. You also need to keep in mind many searchers will rely on Google’s Autocomplete. 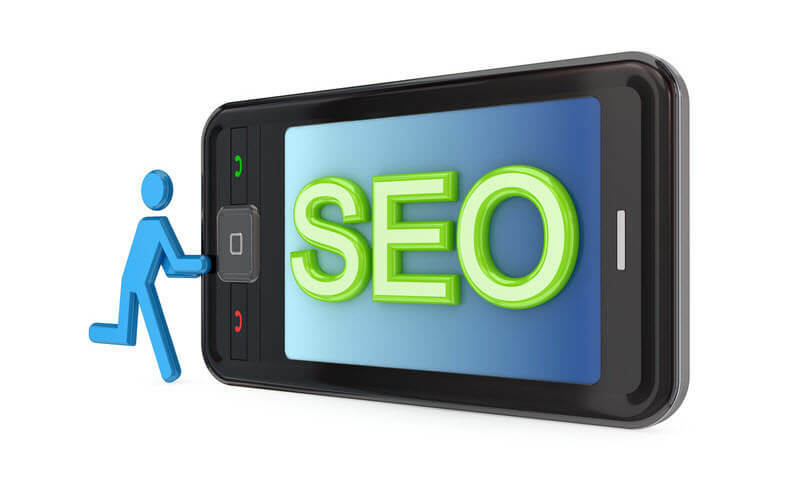 Choose shorter tail keywords to optimize your mobile websites. Most mobile searchers are connected to their social media 24/7 through apps, so make sure the content on your website is entertaining enough to hold their attention and easy to share. Use social media links on all of your pages to make it easy for people to share your content as well. 3. Make Navigation User Friendly! Most people on a mobile device are usingn a touchscreen, so make sure your navigation is streamlined and easy to use. Vertical menus are often the best choice because they’re easy to select and easy to read at a glance. A good mobile website is not just a scaled-down version of the full-size site but instead configured for mobile devices in particular. You’ll also want a sub-domain like “m.mywebsite.com.” Include a link to the full-page website at the top or bottom so you’re not restricting access as well. Remember, most people that find your website on their mobile device are local, so include a convenient click-to-call so they can call you right from the site. Make this number prominent so they aren’t searching for your contact information. If your mobile website has a lot of video or images, chances are it will load too slowly for most users, who will simply go elsewhere. Make sure file sizes are reduced so they render well on a mobile device. It should also be easy to read the content on your website without zooming in, so make sure the screen is just large enough to view all of the landing page without zooming or scrolling. It’s very important for the crucial elements and content of your small business web design to be placed in the right places on a mobile website. The most important elements should be seen right away. Take the time to prioritize the content and decide what works best. Most users won’t want a lot of text right away, so you may want to choose an image with a lot of meaning as well as your brand.